The LP command centre carries a Made in Hong Kong marking at a top edge, almost hidden by the white railing. It doesn't carry a trademark. 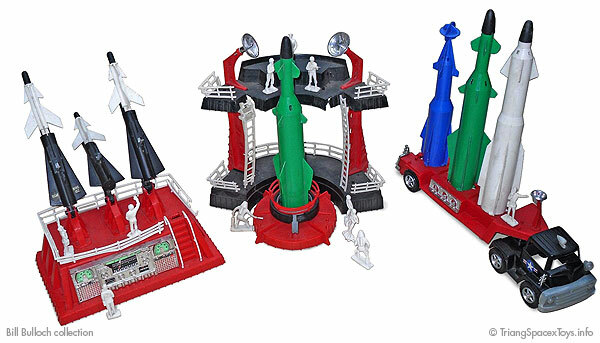 The origin of the LP command centre is the Missile Defence Base that's part of the Rocket Base by Deluxe Reading Toys, which is twice the scale as the LP toys. It dates from ca. 1962 and was also made in the UK. 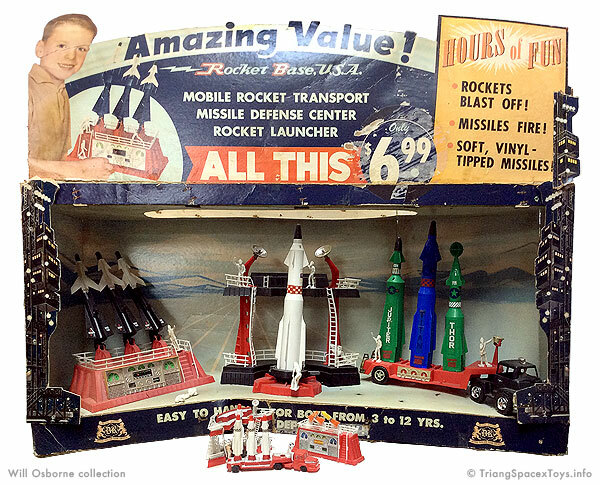 Despite the soft-nosed tips on the rockets, the powerful springs launching them would have this toy considered unsafe by today's standards! 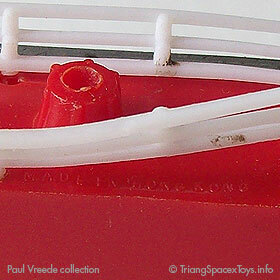 The Deluxe rocket base was copied in H0 scale by an unknown Hong Kong manufacturer. The example above is missing the firing platform, but it's identical to the one below which was made in Singapore by Blue Box, and which clearly shows what the LP command centre is based on. Moonbase Central has a picture of the box for the Blue Box version, which they sold on its own with a few astronaut figures (opens in new window). 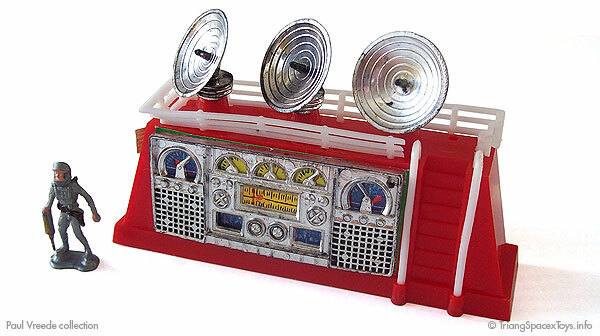 This original shop display by Deluxe Reading has survived at the Osborne toy shop. Judging from the glue stains, it will have had a price in Sterling stuck over the American one. An H0-scale copy of the set sits in front for comparison. Deluxe Reading also produced an even more extravagantly styled rocket base, which is shown here just to be complete. As a final note, De Luxe went through some name changes to eventually become Topper Toys as is well explained by an (unfortunately) anonymous collector.